While my experiment has been around for about 10 years, the search for the electron EDM has been going on for quite a long time – since the 195os, at least. The motivation has always been the same, which is that the existence of a permanent EDM in any particle (electrons, proton, neutrons, atoms or molecules) would violate the symmetry of time. (Click here if you want to learn more about the pesky details why.) And physicists are always interested to learn if the symmetries they take for granted in their equations are actually followed by nature or not. Here is a plot taken from the PhD thesis of Paul Hess (2014), a past graduate in my lab. The horizontal axis is year, and the vertical axis is the upper limit of the electron EDM. The units used are – a unit of charge times a unit of length. (Note that the vertical axis uses a logarithmic scale.) The various markers (squares, triangles, stars, etc.) denote a published experimental result measuring the electron EDM. What we can learn from this plot is that except for a dry period in the 1970s, there have always been experiments searching for the electron EDM, and while they have not found anything (which is why this is a plot of upper limits to the value of the EDM), they have gotten more and more precise – an average of 1-2 orders of magnitude every decade. Let’s get into a little bit of this history as seen in the above plot. The subsequent three black shapes on the plot above (Lamb shift, g factor, He scattering) would all set an upper limit on the electron EDM. However, none of these were dedicated experiments specifically looking for it. The game really changed with the second exclamation mark on the plot, which is a paper by P. G. H. Sandars, an experimental physicist at Oxford (who would also teach Stephen Hawking). Sandar’s paper is very simply titled, “The Electric Dipole Moment of an Atom.” It contains some very technical arguments, but the main point is that we can look for electric dipole moments of electrons and neutrons by looking for an electric dipole moment of an atom. In other words, if the electron EDM is non-zero, then an electron zooming around a nucleus (as it is the case inside an atom) would have a noticeable effect on the properties of the whole atom. Interestingly, this is the case even if the atom itself has a total charge of zero. Prior to this, people had thought (roughly) that neutral, uncharged atoms could not possibly have an EDM. But Sandars showed that this was not the case if you took into account special relativity. where is the atom EDM, is our old friend the electron EDM, and is the enhancement factor. For some atoms, could be very large – Sandars suggested cesium, which was predicted to have .3 This means that the effect of an electron EDM is magnified a hundred-fold if you look for it using cesium. What a great insight this was! 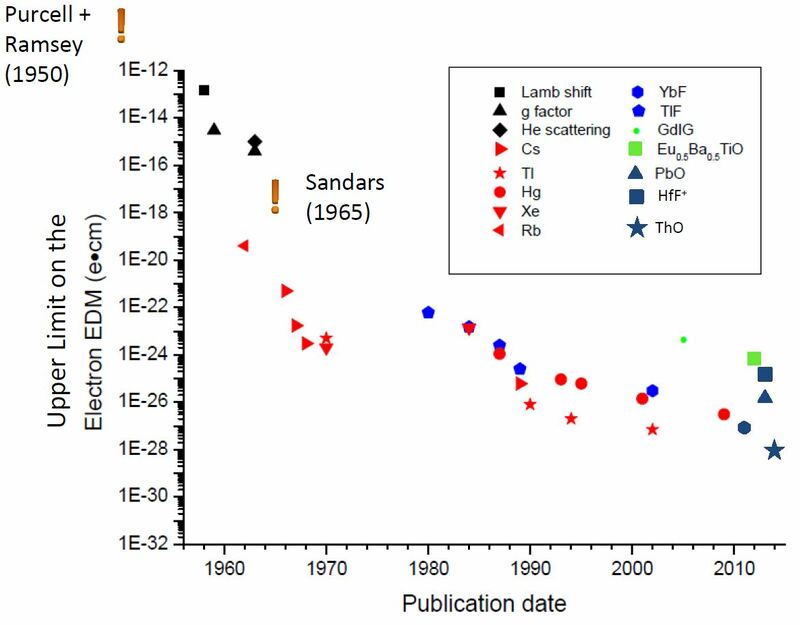 Sandar’s paper can be said to be responsible for the next seven decades of electron (and other) EDM experiments, up to today, including my own experiment. In the next post, we will start talking in more detail about some of these experiments. Stay tuned!